I just need to store this comment from ENENEWS for when I can do some due diligence. Neurotoxins in 97% of algae is not a good thing. BMMA-[beta-methyl-amino-alanine] HIGHLY toxic acid produced by Cyanobacteria. An international team of researchers from Dundee have detected a neurotoxin in 29 out of 30 samples of blue green algae they have tested. Sourced from Scotland, Ireland, the Netherlands, Israel, India, Australia, the U.S., Guam and elsewhere. SCIENTISTS STRESS PRECAUTIONS SHOULD BE TAKEN, PARTICULARLY WITH DRINKING WATER. BMMA should be monitored in water sources including reservoirs. Research leader, Paul Allen Cox, Hawaii Institute for Ethnomedicine. Potential for widespread human exposure: ALGAE. Toxic to fish, shellfish, pets. Linked to brain disease in humans. 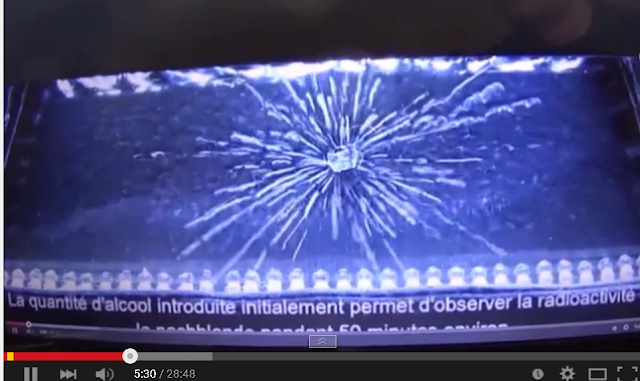 At about 6 minutes into the above video, he conjures up a way to view alpha particles in real time. It is pretty interesting,, it demonstates the different distances that Alpha flies, as well as a pretty uniform spherical distribution of disintegrations.